As it was sunny this evening I decided to take a ride through Highfields again. There was of course several students taking photos and selfies with the cherry blossom. I noticed these two girls standing on a concrete plinth taking selfies of themselves. So grabbing my camera, I took a couple of candid shots. They then noticed me and started to laugh. They hopped down from the plinth and I asked them if they fancied having their photo taken. 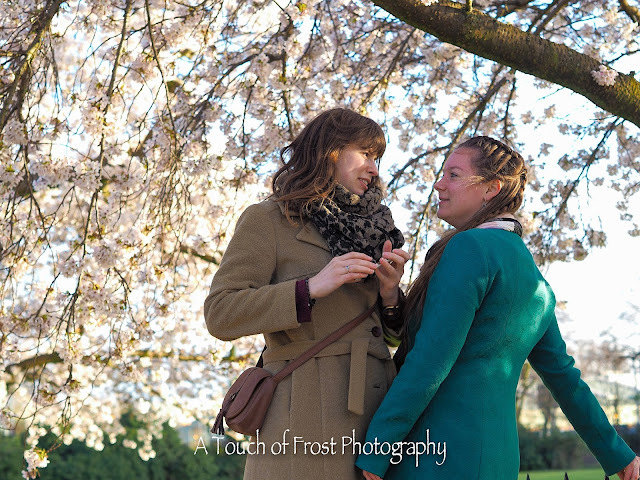 They agreed, and we did a mini photoshoot under the blossom. They were German students and asked if I could send them some. Of course I promised. Which I have duly done.